122 min [ Twenty-seven banks in three years. Anything to catch the perfect wave. ] - In the coastal town of Los Angeles, a gang of bank robbers call themselves The Ex-Presidents commit their crimes while wearing masks of Reagan, Carter, Nixon and Johnson. The F.B.I. 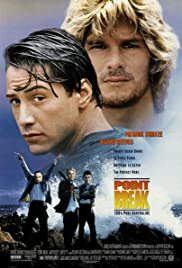 believes that the members of the gang could be surfers and send young agent Johnny Utah undercover at the beach to mix with the surfers and gather information.